MASON an amazingly powerful WordPress Blog Theme specifically designed for writers, bloggers, online publishers and content creators. 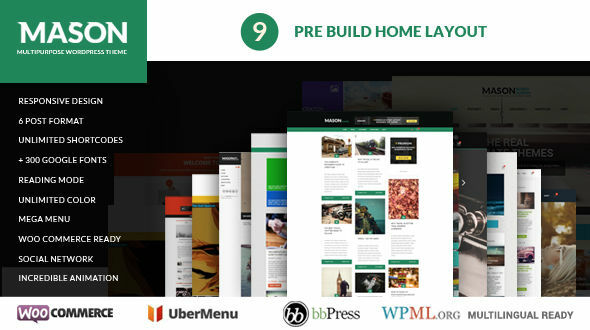 It offers several features like multiple homepage layouts and shortcodes. Ultra Responsive Life is change, now we live in a mobile world era. It’s absolutely important thing that your website be as accessible as possible on all devices. So fire up your website on 27” iMac, 11” netbook, 4” iPhone , Kindle Fire, Android phone, or anything else – MASON always look great on all of them. Mega-menus Powered by UberMenu UberMenu is the number one mega-menu plugin for WordPress with over 20,000 sales. It was created by the menu master himself, SevenSpark. We’ve worked directly with SevenSpark to custom develop this version of UberMenu just for our themes. UberMenu is a user-friendly, highly customizable, responsive Mega Menu WordPress plugin. It works out of the box with the WordPress 3 Menu System, making it simple to get started but powerful enough to create highly customized and creative mega menu configurations. One Click – Import Demo Data A set of demo data describing various unique layouts, complete with pictures. Just with one click, your website already has a lot of content such as pages, posts, slider, widgets, theme options and more. It becomes the easiest and fastest way to build your website. Typography Management If you have good Typography in you website it’s mean will allow your visitors more easy to understand what information will you provided. We’ve not only included over 500 free Google Fonts to use in your theme, we’ve made it so that all have good aesthetics. Each font are dynamically loaded, and you can customize with attractive touch, adjust sizes, colors, letter spacing, capitalization, and so much more. WooCommerce Its’ really easy to sell online , Woocommerce can make this happen. Easily Integrate your WordPress website into a full well-done eCommerce storefront with the click of a mouse (and for sure no additional cost). The MASON WordPress theme is fully integrated with the latest version of WooCommerce plugin for those who need it; however, if you don’t need an eCommerce feature on your site there will be no additional impact on your site’s performance. Custom Backgrounds Set the background to your site helps to reinforce the mood you are trying to achieve. Simple color can be light, clean, and professional. Or patterns can also give the impression of texture and depth. With MASON theme allows you to set the background image is unique. You can add a custom background image such as a picture or pattern body Fullwidth website or simply add a custom background color. You can also control the opacity of the background to this particular sections. A super-fast way to get creative with your site.